This week and next, our colleague Peter Cook will be blogging a four-part series on the education reform process in the Jefferson Parish Public School System in Louisiana. Stay tuned for more! White has good reason to be excited about the example set by Jefferson Parish. 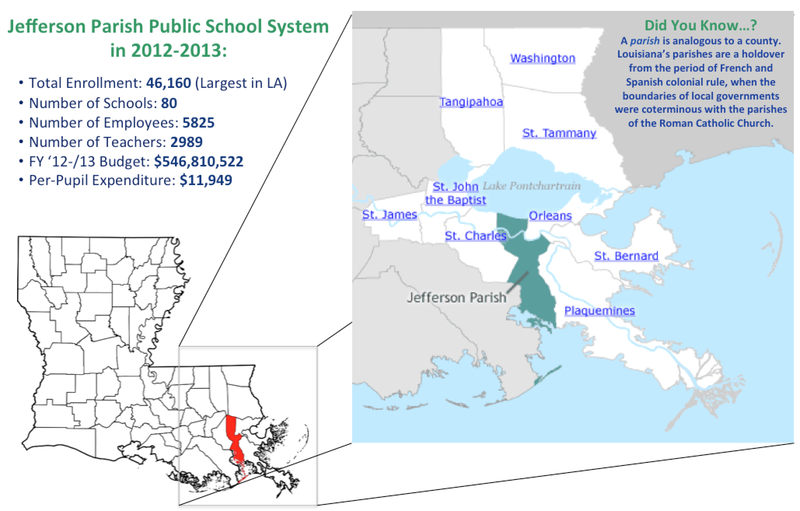 In the space of just three years, the Jefferson Parish Public School System (JPPSS) has emerged as one of the most improved school districts in Louisiana. As recently as the 2010-11 school year, JPPSS ranked 51st out of 70 districts in the state based on academic performance. Nearly 40% of the district’s 8th graders were below basic in ELA and Math on Louisiana’s LEAP test and approximately 30% of high school seniors were failing to graduate on time. In addition, the district faced the potential takeover of several its schools, 59 of which were graded “D” or “F” by the Louisiana Department of Education. However, in the course of the past two years, JPPSS has witnessed a startling turnaround thank to a series of bold reform initiatives spearheaded by Superintendent James Meza. The district’s performance has increased in almost every grade and subject area, and in particular among district’s long-underserved African-American and special education populations. And just this month, Jefferson Parish officials announced that the number failing schools in the district had fallen from a high of 18 in 2010 to only 4 this past school year. What makes these gains particularly noteworthy is the fact they have been achieved within the context of a traditional, school board-governed district. In this sense, the lessons from Jefferson Parish have broader application than those of New Orleans, where officials had the singular opportunity to rebuild the school system after Katrina. In contrast, the reforms in Jefferson Parish were developed by district leaders and implemented with the support of the school board and community. Community Investment: There was a recognition in the community that the school system needed reform, as reflected in the election of a pro-reform slate of candidates to the school board. Determined Leadership: JPPSS Superintendent James Meza began implementing long-overdue changes almost immediately after his appointment, all-the-while carefully building support for a comprehensive reform plan. Strategic Planning: Jefferson Parish partnered with Mass Insight to develop a comprehensive reorganization plan that reoriented the district around the needs of schools and students. In subsequent posts over the next three days, we will look at each of these elements in greater detail to examine the critical roles that each factor played in Jefferson Parish’s transformation. Please join us Thursday for Part II on Community Investment. Only one of these four schools is a traditional JPPSS school; the rest are temporary alternative schools that students attend while on expulsion. Peter Cook leads Mass Insight Education’s engagement with the Jefferson Parish Public School System and lives in New Orleans. You can follow him on Twitter at @petercook. Peter’s tweets are his own.